I hope we get to see Nagisa in a wedding dress. yeah how many success stories do you find in reality like this one? 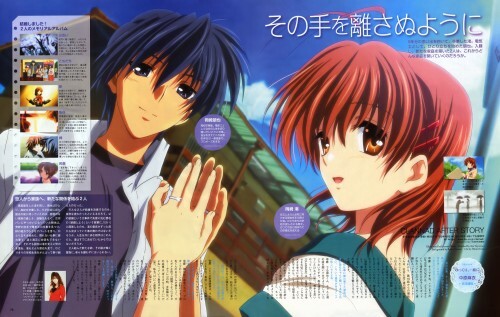 this is so sweet =D tomoya and nagisa are a sweet couple indeed. I really love this couple, they're just perfect for each other! have a explication why the world hate me so much, and have to distroy this beautiful couple? Cool, they're married! I also like Tomoyo, Kyou and Kotomi to be with him, but Nagisa's number 1.
gracias x el excelente scan!